The Victorian furniture collections at the Ebenezer Maxwell Mansion are of the highest quality, making this place worth a visit!! There’s just so much more to see…. 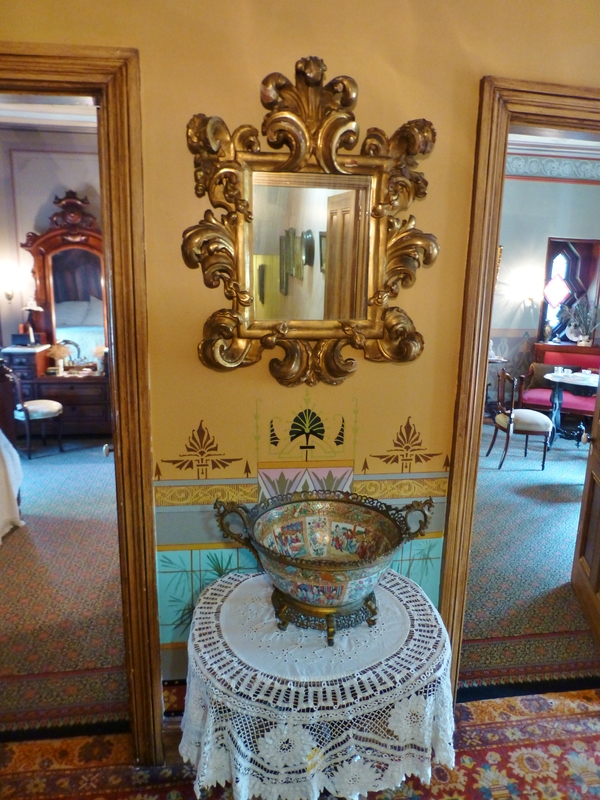 Today I’m featuring another post on the interiors at the Ebenezer Maxwell Mansion in Philadelphia, PA. This will be my fourth post about the interiors of this amazing architectural gem! 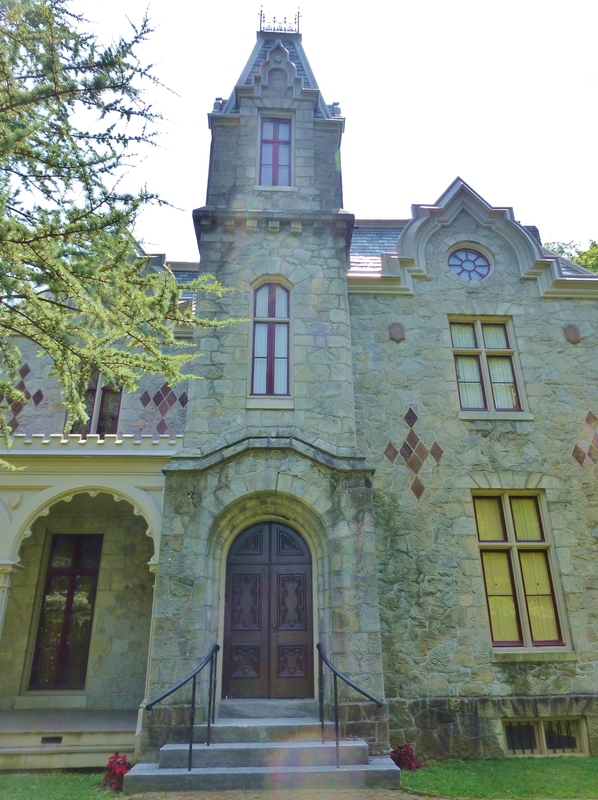 The Ebenezer Maxwell Mansion in Philadelphia, PA. A fine example of Victorian Gothic and Second Empire architecture. 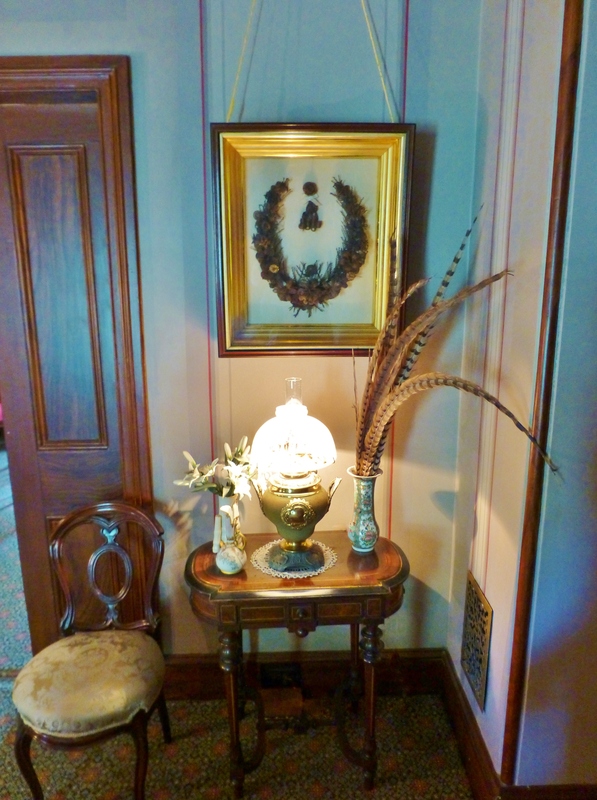 I’ve already shown you the main floor entrance, parlor, study, and dining room. Last time we went upstairs to look at the children’s room. Today, you’re in for a treat, since we are headed into the beautiful Master Bedroom and the adjacent Lady’s Lounge. 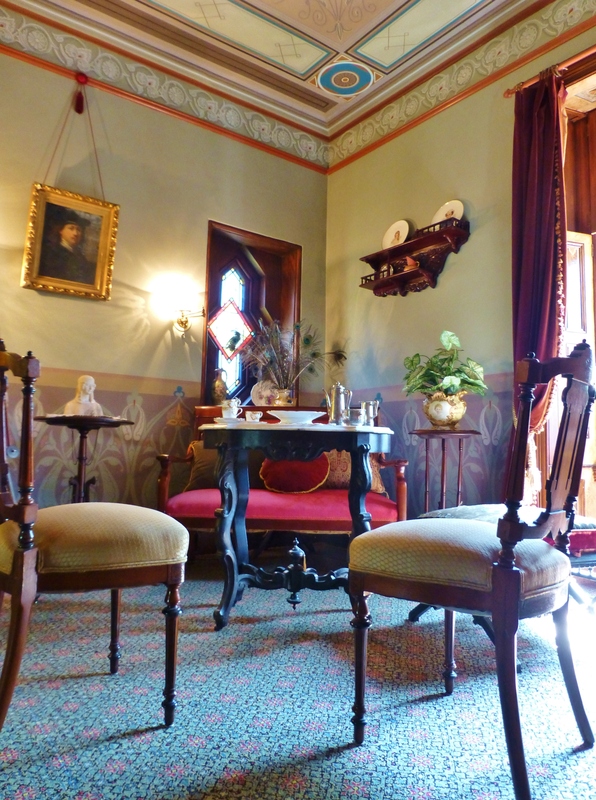 These high style Victorian rooms are ornate and decadent! Back in the upstairs hallway, a stunning Italian-style gilded mirror welcomes you between the entrances of the two room suite. From this vantage point (exiting the Children’s room, behind you) the bedroom is at the left and the lounge at the right. Notice the handpainted wainscoting behind the lace-covered table. You’ll also notice the layering of patterns with the area rugs in this image. Let’s start by visiting the bedroom on the left. Entering the master bedroom at the Ebenezer Maxwell Mansion, you’ll notice the handpainted ceiling with clouds and cherubs. The walls also feature handpainted panels. There’s an imposing Renaissance Revival vanity across the room with wall-mounted sconces too. At the far corner of the bedroom, to the left of the vanity, sits a wash-stand with a bowl and pitcher. This was a necessity in a house with no bathrooms! 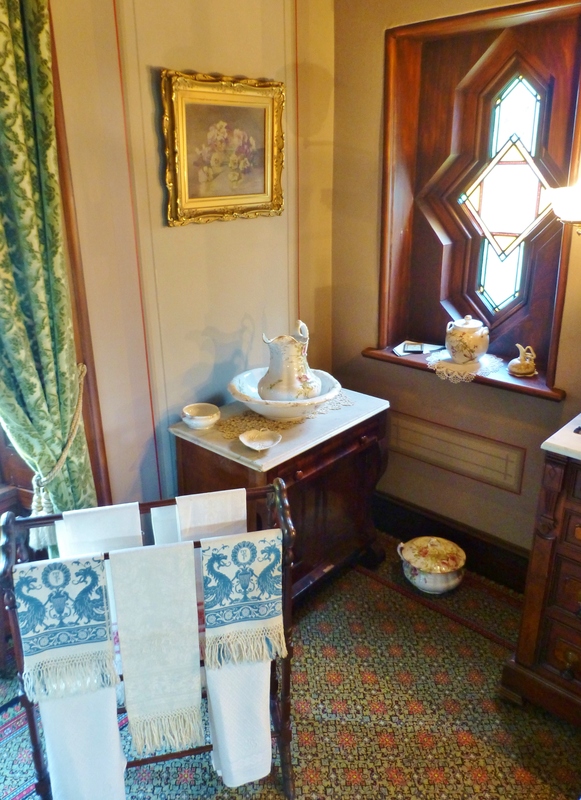 Speaking of which…can you see the chamber pot beneath the window? My father always calls them ‘thunder mugs’. 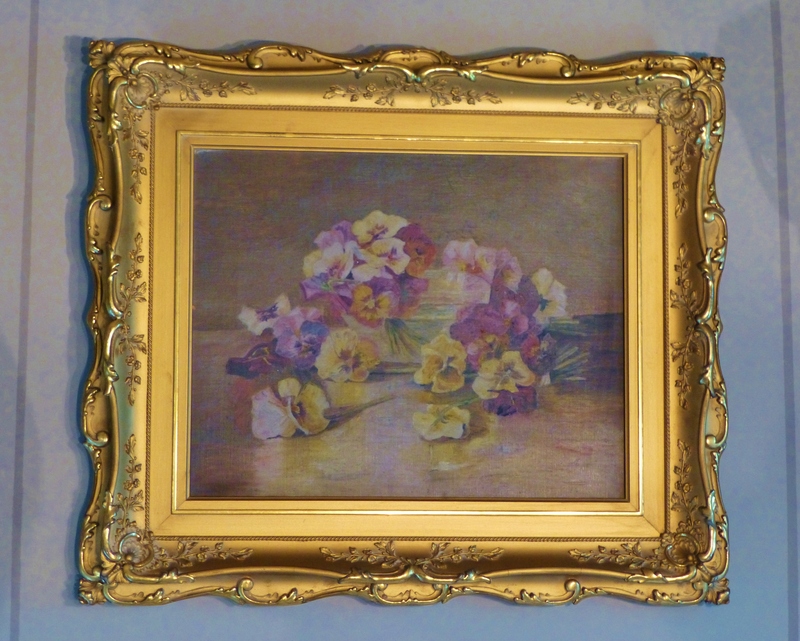 I find this charming oil painting of pansies particularly attractive. The Victorians loved painting still-life flowers and fruit like this. What a great gilded frame it has too! I managed to get a close-up of the phenomenal hand painted stained glass window (there’s another one in the lounge). The shape and color of these is truly stunning! They feature botanicals with birds and insects. 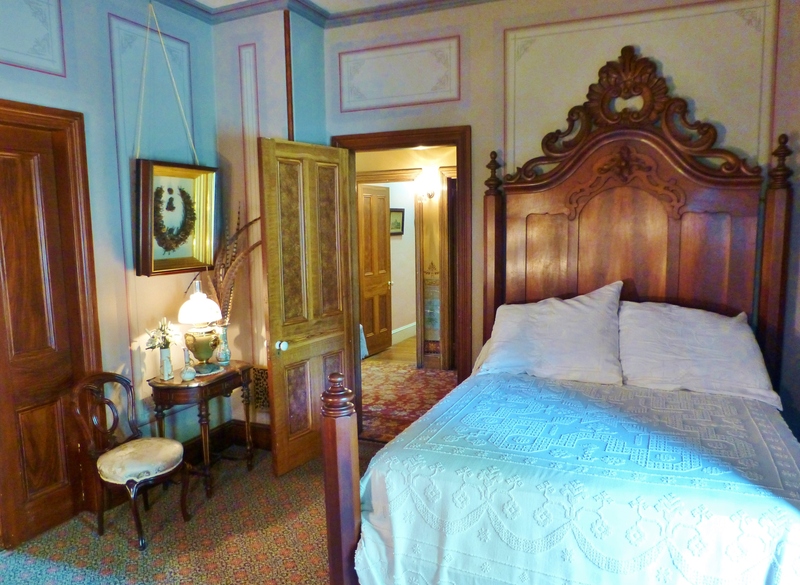 If you turn around and look back towards the entrance, you’ll notice the Rococo Revival Headboard (it’s much more curvy than the Renaissance Revival style furnishings) and the Candlewick bedspread (which was popular at this time). 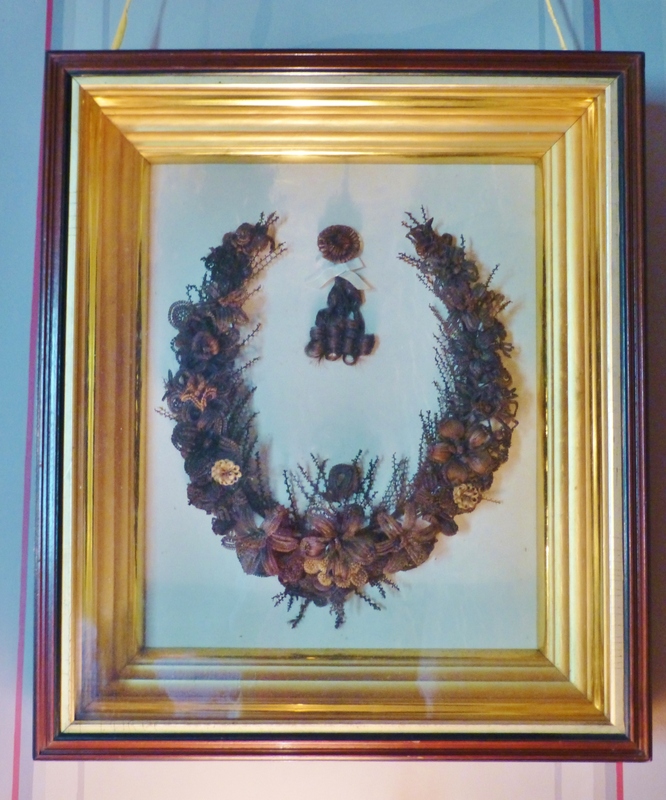 An intricately woven bouquet composed entirely of human hair hangs in the master bedroom at the Ebenezer Maxwell Mansion. These hair wreaths were very popular in Victorian times, and the process of mounting the strands onto wirework frames was an acceptable pastime for Victorian ladies. Many people would walk right by this handsome example of a Victorian Hair Wreath and not recognize its origins as human hair. Many would also consider the idea of using hair in this way as gruesome or macabre. The Victorians were very sentimental, however, and viewed this as keeping a part of their loved ones near. Beautiful pocket doors lead into the adjacent lounge. Let’s go explore in there! 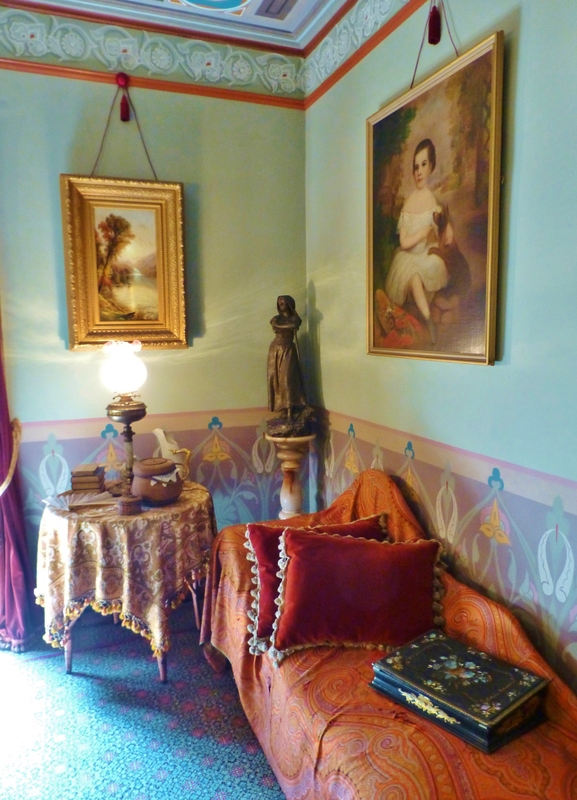 The right hand corner of the room features a chaise draped with a Paisley Shawl (very trendy at the time) and the left corner is set up for tea. The lounge portion of the space has a papier-mache lap desk on the chaise for writing letters or composing poetry. The luxuriously draped table contains books and sewing implements…appropriate lady-like activities. Across the room you’ll notice a red settee behind a small Ebonized table set for tea. In this image you’ll notice the ornately handpainted wainscoting, frieze, and ceiling. The color combinations here are fantastic: lavender, rose, gold, turquoise, and green. 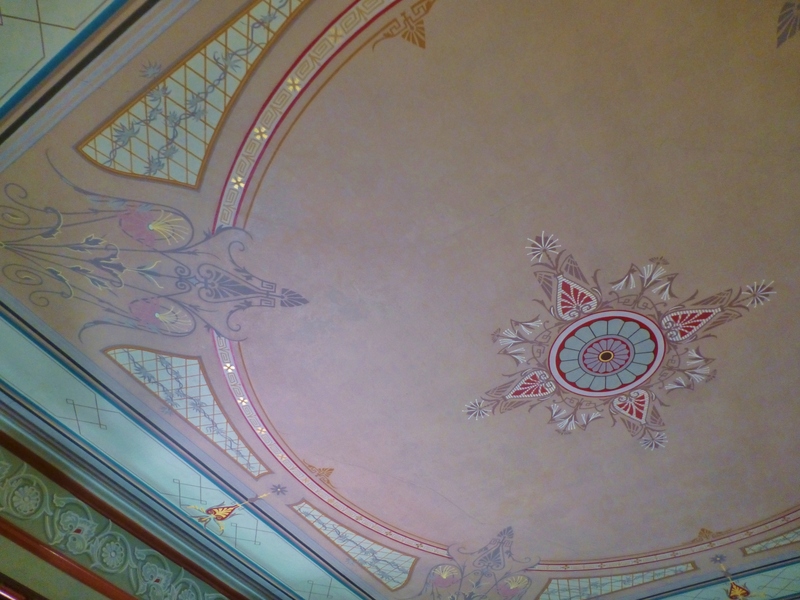 The ornate painted and gilded ceiling in the ladies lounge at the Ebenezer Maxwell Mansion. In a corner near the entry to the bedroom, sits a small desk and chair. 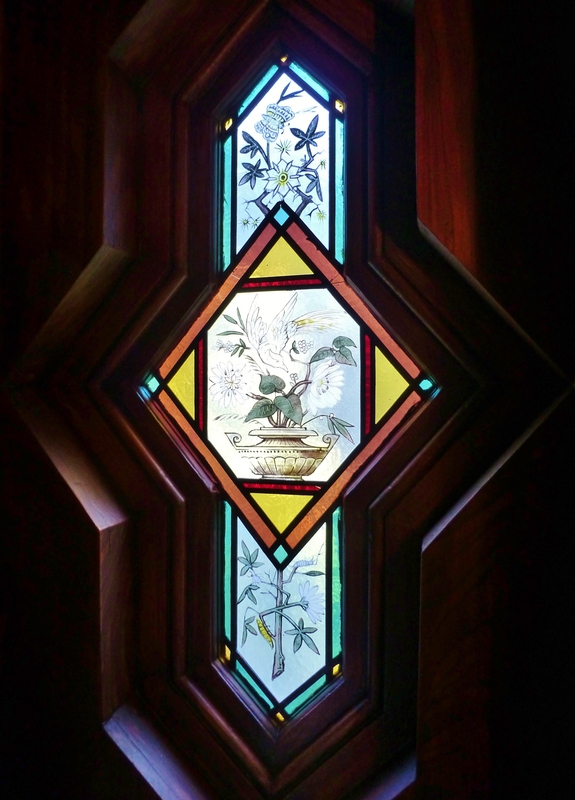 This photo shows a door with handpainted woodwork featured in the lounge. You’ll also notice the draperies on the pocket door. These are called Portieres and, in addition to being decorative, helped to further divide and provide insulation between the spaces. 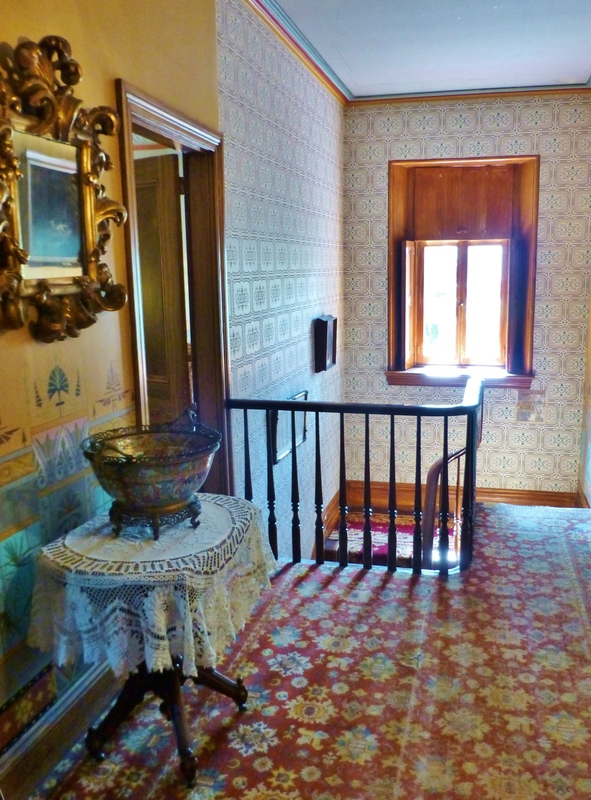 That brings us back out to the sun-lit stair landing of the Ebenezer Maxwell Mansion. Weren’t the bedroom and ladies lounge both fantastic? The Victorian furniture collections at the Ebenezer Maxwell Mansion are of the highest quality, making this place worth a visit!! 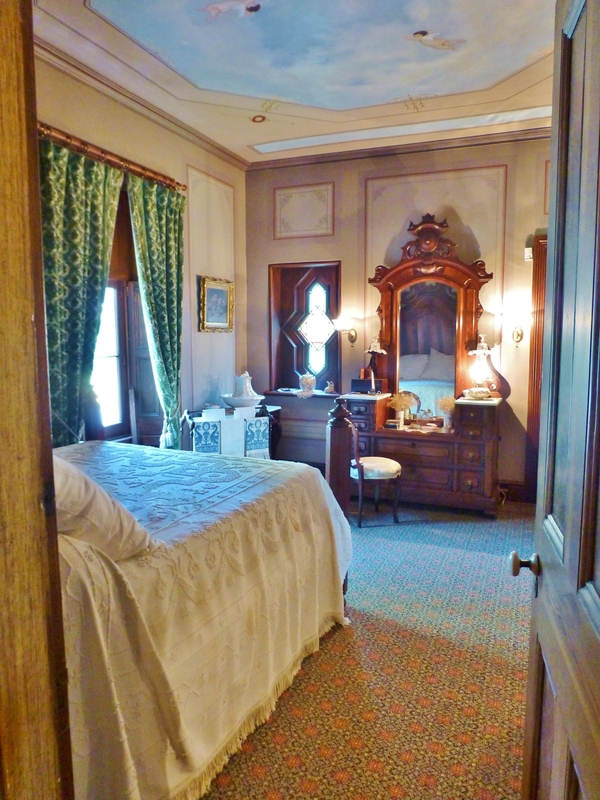 There’s just so much more to see….and rooms I won’t get time to show you. Next time I’ll finish up this series at the Ebenezer Maxwell Mansion by showing you the kitchen. 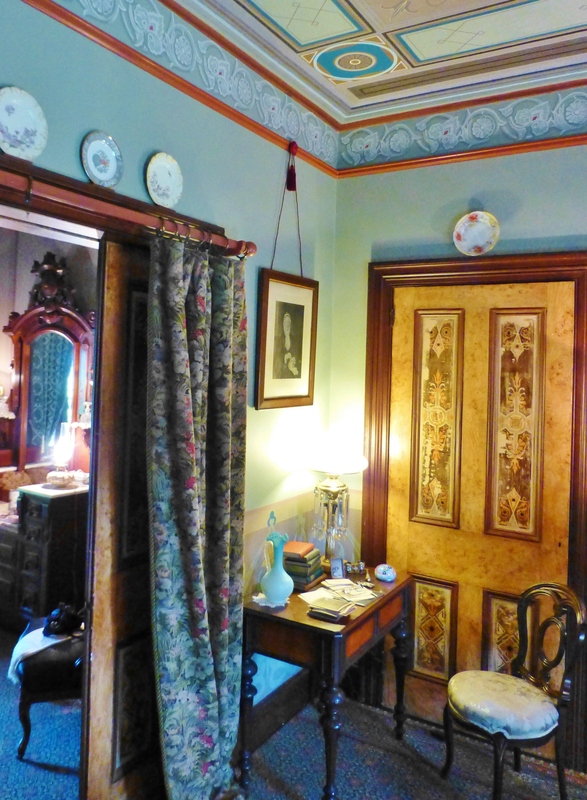 It’s fascinating to see how a normal Victorian household functioned! 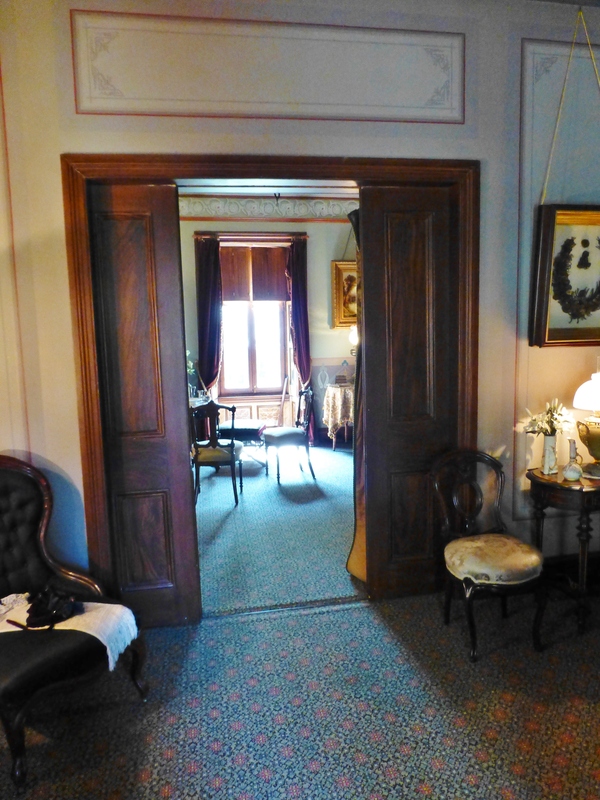 Until then, please post your comments telling me what you think about these Victorian rooms. 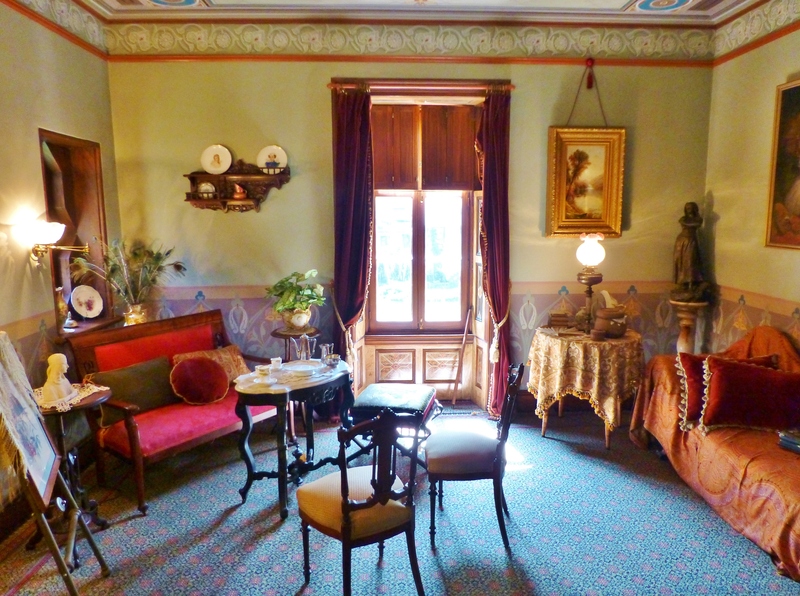 Can you picture yourself living in spaces like these back in the 1800’s? This entry was posted in Antiques, Furniture, Historic Sites, Mansion, Victorian and tagged Bedroom, Chaise, Decorating, Design, Ebenezer Maxwell, Hair Wreath, Handpainted, Interior, Renaissance Revival, Robinson interiors, Rococo Revival, Vanity. Bookmark the permalink.